The Newest Rant: Let me get this straight--This Game is Delayed AGAIN? Let me get this straight--This Game is Delayed AGAIN? 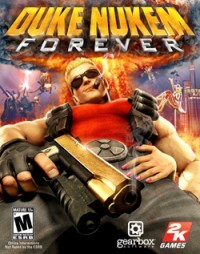 Okay, let me get this straight: Duke Nukem Forever, arguably the most delayed game of all time at about 14 years past the original release date, which was picked up by the company Gearbox when it looked like it might finally be dead, and then was given an actual release date of May 2011...has been delayed yet again? For real? After all that talk about how Gearbox was finally finishing it they pull this trick and tell us we have to wait until June 14th for a game people already probably have way too high expectations for? That's what the case is? Okay, fine, I just wanted to be sure about that. I'm going to roll my eyes as high and hard as I can now at this news, realizing I shouldn't believe this game is ever coming out until it is actually sitting on store shelves and I can rent it.